As a small town American girl, I absolutely love pie! Pie always brings me back to my grandparents, Summer gatherings on the deck and Thanksgiving dinners at the table. While I would have to say that Raspberry pie is my favorite, there’s just something about an old fashioned apple pie, maybe it’s the sentiment, maybe it’s the cozy flavors wrapped into one delicious dish, but it sure is something special. 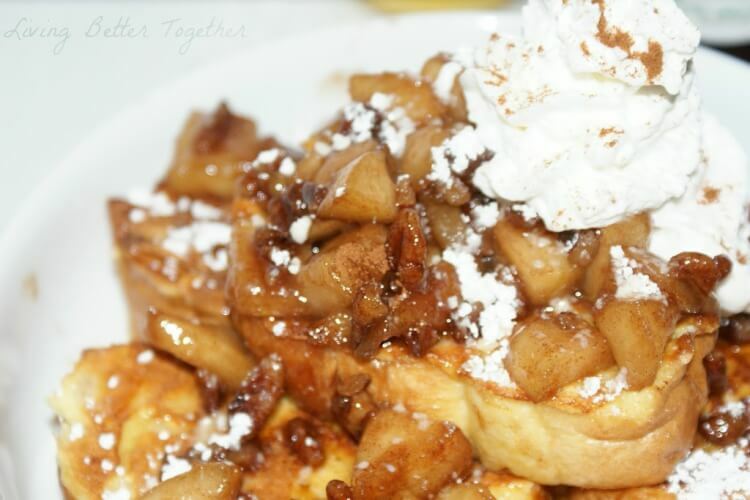 Last weekend I decided to put a twist on this classic dish and make Apple Pie French Toast, I know, that’s got to be a conflict of interest or something. 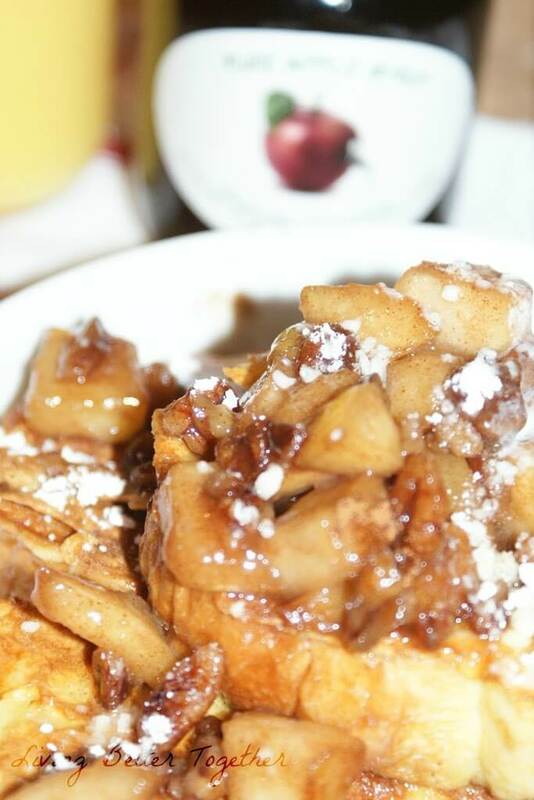 However, golden brown french toast smothered with warm caramelized cinnamon apples and pecans and topped with whipped cream, a dash of confectioner’s sugar and a local Apple Syrup from Cayford Orchards sounds pretty mouth watering doesn’t it? You probably have most of the ingredients right in your fridge or pantry. Stop by the store on the way home and grab the rest and start your 4th of July holiday week out right tomorrow morning with this delicious and indulgent breakfast! As if my love for Stonewall Kitchen wasn’t obvious enough on my blog, you can grab a bottle of their Cinnamon Apple Syrup if you can’t find a local apple syrup. Add all Apple Pie Topping ingredients into a pan and simmer on medium heat until apples are tender. Wisk together eggs, milk, vanilla, flour and salt. Cook on medium heat until golden brown, flip and cook other side. Plate and top with Apple Pie mixture, whipped cream, apple syrup, confectioner’s sugar and cinnamon. This is so creative and such a great idea! I have to make this for my family because it looks simply delicious! Thanks Sierra, it really was pretty easy to make! If you love apple pie, you’ll love this! Thanks for stopping by! This looks soooo tasty. 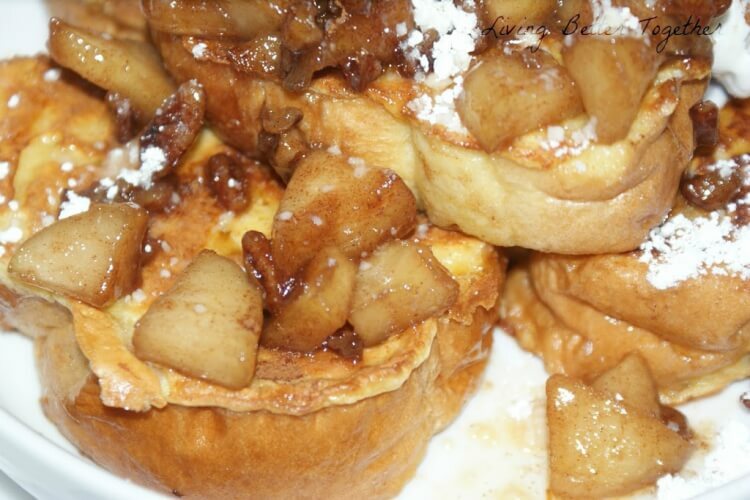 Anything that has apples AND french toast in it = amazing! Thanks for linking at the lady’s blog hop. Come join on Monday for pinterest hop. Mmmmmmmmmm. Whoever said apple pie could only be had during the holidays is a dirty liar. Yum, Yum, Yum! OH my did I say this looks so good. Hope you’ll share it at Tuesday Trivia this week. Thanks for stopping by Let’s Get Social Sunday. 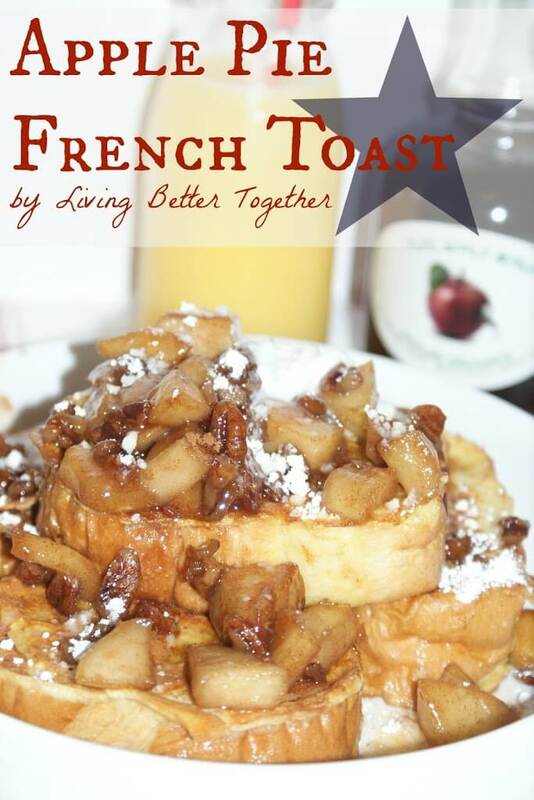 What a great way to eat french toast! My family would LOVE this! Thanks for stopping over to Super Sunday at Who Needs a Cape? Hope we see you next week! Oh this French toast looks epic! 🙂 Thank you so much for linking up with me this week at Tasty Tuesdays! I’ve pinned this & shared it with my followers! Please be sure to stop back by the party and check out some of the other links! Thanks for linking on Tasty Tuesdays! I am one of the co-hosts this month and I love this recipe!!! Hi Rebecca. What a gorgeous looking dish. Your recipe will be featured at tomorrow’s Thriving on Thursday party. thanks so much for linking up. Hope to see you again.